If you awoke this morning with a terrible jolt, possibly as ominous storm clouds began to swirl around your dreams and the only thing drowning out your screams were the screams of all of humanity, it may be because archaeologists in Egypt have opened the mysterious black sarcophagus that was found in Alexandria earlier this month. 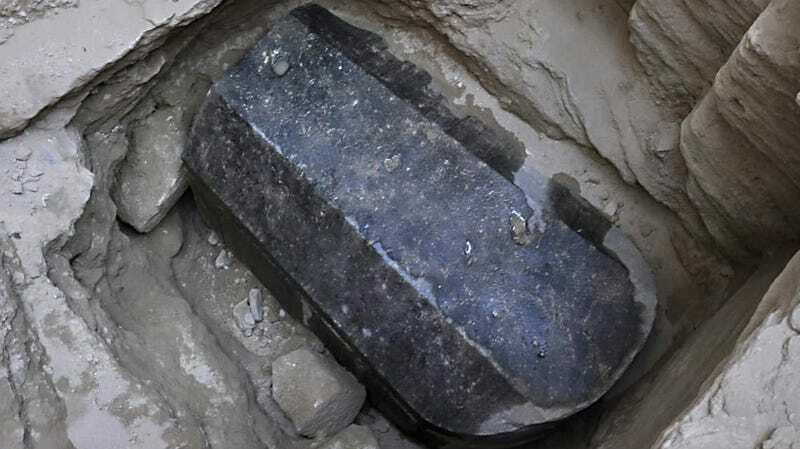 Carved from black granite, the sarcophagus was believed to be 2,000 years old, and though the theories were immediately shot down, some suggested upon its initial discovery that it may contain the remains of Alexander The Great. The far more believable theory, however, was that the black sarcophagus contained the very doom of all mankind, possibly in the form of some terrible curse or ancient evil that should have remained buried. That doom was unleashed today, with Secretary-General Of The Supreme Council Of Antiquities Mostafa Waziri making this chilling statement, a portent of the many nightmares that are to come: “The sarcophagus has been opened, but we have not been hit by a curse.” Ooh, spooky! Oh, wait… So, apparently there was no curse? According to Egypt Today, the archaeologists say they found “three decomposed mummies” that belonged to either a “Ptolemaic or Roman royal family,” but there’s nothing on or in the sarcophagus that gives any indication of who they were. Also, a mysterious red liquid that was found inside the tomb with the sarcophagus turned out to be sewage that had leaked in, and not some kind of magic elixir that could’ve granted the entombed villain immortality. Basically, we dodged a real bullet here, at least in the sense that the mummies aren’t going to come to life and kill us. Mankind is still fairly doomed in the long run, even if global warming or nuclear war aren’t as thrillingly mystical as a mysterious black sarcophagus. Is it too late to rebury this thing and just put a note inside that says “global warming” in big letters? At least then a future society will know what happened to us. If not global warming, it'll be robots.